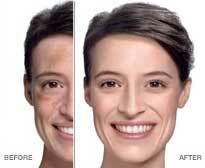 Vitiligo (white spots) is a disfiguring medical disease whose cause is unknown. The disease causes destruction or loss of function of melanocytes in the skin, mucous membranes, eyes, inner ear, and occasionally in hair bulbs. Melanocytes produce the pigment that gives skin its color. 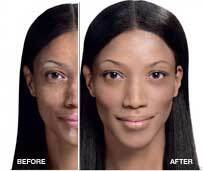 The loss of melanocytes alters both the structure and function of these organs and results in the absence of pigment. Technique: The treatment used is the application or ingestion of a drug (psoralens) followed by exposure to ultra-violet light (sun light). This combined treatment is known as PUVA or PUVB. Patients not responding to this are then subjected to skin coloring and surgical treatments: The area of skin lacking pigmentation must have its outer layer (epidermis) removed, Once the skin's outer layer has been removed, melanocytes are then transplanted. The melanocytes are obtained by removing the top layer of normal skin (the epidermal graft) from a normally pigmented area of the body. These grafts are 0.006-inch (0.1524-mm) or thinner in thickness. The width and length varies depending upon the size of the area to be re- igmented. The graft is then placed over the area that had been sanded (dermabraded or prepared with the laser) and secured to prevent any movement of the graft. The type of anaesthesia required will depend on the area of the surgery. Complements: Specialized Skin treatments help obtaining better results. Results: Normal Reddening of the area and dressing, dressing taken off in 7-10 days. During the first 6 months following the procedure, the re-pigmented regions are hyper-pigmented (darker in color than the surrounding skin). Gradually, over the next 6 to 12 months the color of the transplanted area approaches a more normal color.